In September 2004, Mexican artist Miguel Calderón secretly placed a TV set in a bar in Sao Paulo (Brazil). At a certain moment, an unannounced soccer match showed up in the screen. 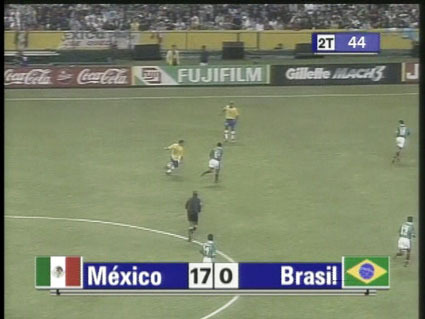 Mexico was playing against Brazil. Bar customers, who had no idea about the match, thought that somehow they missed the news. People started watching the match. Brazil lost 17-0. SOKKOMB is a new low-cost product designed specifically for all those citizens who are so interested in Do-It-Yourself Justice. Are you full of energy? Have you lots of things to do and too little time to do them? Are you increasingly annoyed by all those criminals, immigrants and petty people who should just be got rid of? Your dynamic, active rhythm demands quick, summary justice and you are the person to do it, but too often you just don’t have the time and your family is increasingly in danger. 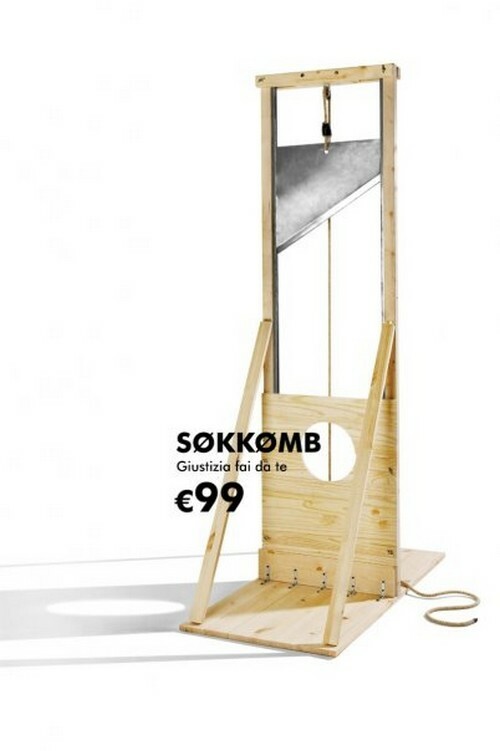 Then you are the person we thought of when we designed “Sokkomb”, an easily-assembled guillotine for the whole family, the practical solution, quick and clean, perfect for all your security needs. By assembling Sokkomb in the comfort of your own living room, you can relax safe in the knowledge that the punishment will fit the crime. So you can finally be your own boss in your own house. SOKKOMB is made from the best solid pine and comes equipped with a sturdy blade in stainless steel. It is light and versatile and is guaranteed effective for up to 100 executions a day. Here’s a great video documenting some of Joey Skaggs‘ famous hoaxes, along with a hilarious in-depth look at a 1995 hoax where he fooled the UK media into believing he was a guy that ran “howling therapy” sessions. In 1995, Baba Wa Simba (aka Joey Skaggs), a new-age therapist, whose mission was to work with disenfranchised and troubled youth and heal the wounded animal within, visited his lion pride in London. The Word, a television show on the UK’s Channel 4, documented the visit and aired it March 3, 1995. The video of this visit has just been released online. A Guy Fieri impostor was interviewed on-air Monday night during Fox Sports Net’s broadcast of the Royals game. Guy Fieri, for those who don’t know, is the Food Network host of “Diners, Drive-ins and Dives.” He travels the country visiting these places. He has been to Kansas City before. The impostor gave interviewer Joel Goldberg’s questions short, rude, one-word answers. He was acting like he wanted no part of the interview. He took a phone call during the interview. The real Guy Fieri updated his Twitter status to let everyone know it wasn’t him. I wonder if the guy planned to impersonate Fieri or if the sportscaster just spotted him, and he decided to play along? If I were to rate a fill-in-the-blank contest of “Who’s a random, specific celebrity to impersonate in a public setting?” the host of cable TV’s Diners, Drive-Ins and Dives would receive awfully high marks. 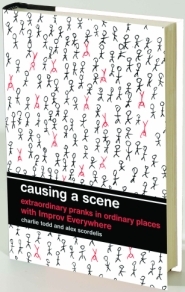 In case you didn’t hear, the Improv Everywhere funeral prank was a hoax for April Fool’s Day. The family members were all actors who were friends of the group. Today they released a video of outtakes from the shoot. The craziest thing about all of this is that the local news covered it as a real event, not even bothering to get a source other than a YouTube video posted by a prank group on April Fool’s Day. Ridiculous! In January of 1997, Upright Citizens Brigade member Ian Roberts managed to get himself on The Today Show as his character Steve Youngblood. The UCB had recently relocated to New York from Chicago, and this is one of several hoaxes they pulled on an unsuspecting Al Roker. Roberts is referencing Thunderball, a fictional sport created by the UCB which would appear on their Comedy Central television show a few years later. Today’s post is the first in what will be an ongoing series where we flashback and take a look at awesome projects that while not new, are hopefully new to our readers. If not, enjoy a good idea for the second time or keep moving to the next post. 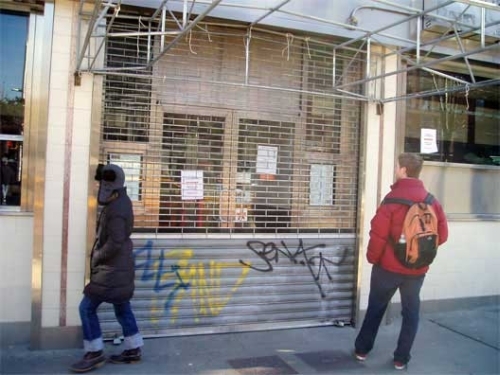 Because I inadvertently pulled the prank over a three day holiday weekend (President’s Day) it had unintended consequences: the Hooters main office was not open to take calls from concerned East Village neighbors. Also, Hooters has a policy that it cannot confirm or deny where or when they are opening a new restaurant. Maybe because people would protest? I don’t know, but that definitely added fuel to the fire, when they started fielding calls and emails when they returned to the office that Tuesday. Eventually the pranksters came clean on eater.com and the controversy came to an end. The Second Avenue Deli moved to 33rd Street, and Hooters still maintains its one New York location in midtown. Do you know of a classic urban prank that we should cover? Let us know about it!